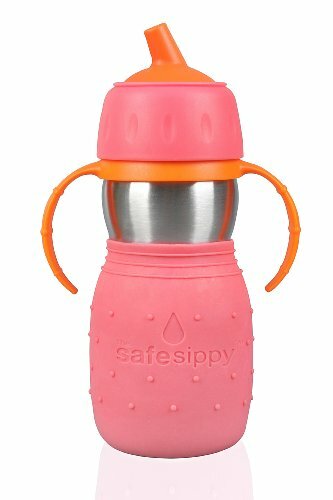 KID BASIX "FUN"CTIONALITY: The Safe Sippy 2 has all the great features of the original Sippy; straw shaped spout for developing palettes, removable handles, slim waist for easy grip and a colorful TPR sleeve to insulate and protect the bottle from dents. NEW DESIGN: Now includes the things parents asked for most; a dust cap to keep the spout clean and a straw adaptor/straw combo. Simply replace the sippy valve with the straw combo and then your child can use a sippy or sip freely with an upright straw cup! TRAVEL PROOF: Silicone spill-proof valve help prevent messes on the go and slow the flow of fluid while your child is learning to sip. Replace the Sippy Valve/Straw Adaptor with the seal Travel Plug when the cup needs to be completely sealed in transit. GREAT SIZE & DISHWASHER SAFE: Comes in one easy 11 oz size perfect for lunch boxes, travel or outdoor play. A single-walled design is lightweight and maximizes capacity. The cross-cut valve is one piece making it easy to use and put in the dishwasher. ENVIRONMENTALLY FRIENDLY: Products are made of clean, naturally antimicrobial stainless steel & plastic (only if necessary). All are certified chemical, BPA/Phthalate free & safe for kids' food/drink. Help eliminate waste with Kid Basix reusable products. The Safe Sippy 2 bottle is the world’s first 2-in-1 sippy-to-straw drink cup for kids. <br>-11 ounce volume <br>-18/8 stainless steel <br>-BPA and phthalate free <br>-Modular valve system: No spill sippy valve, straw adaptor + straw, travel plug <br>-Dust Cap to keep the spout clean <br>-Straw shaped spout designed specifically for developing palates <br>-Removable handles <br>-Colorful TPR sleeve that provides insulation and protects the cup from denting <br>-Dishwasher safe<br><br>We are makers who design for little hands. <br>We are parents who want big solutions for your children and ours. <br>We are innovators of food and drink ware for kids. <br>We care about "FUNctionality," so your children can hold their cups and bottles securely and can open and close their containers by themselves. <br>We care about using safe materials to store your children's food and drinks. <br>We support schools in their request for trash-free lunches in an effort to eliminate waste. <br>We support nurturing the environment where your children are growing up. <br>We love what we do for your children and ours.